This one could be a hit. Sometimes you just feel like going out with your friends and having a good time. You know that you’re not going to be the toast of the town or anything like that, but you’re going to have some fun and let loose a little bit. 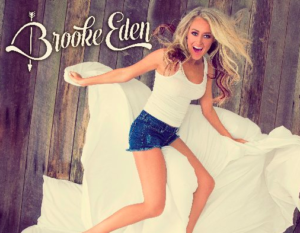 This is kind of a cool new song from Brooke Eden. She’s on the Broken Bow roster with their Red Bow division. That label has been having some great success with a number of artists and they’re trying to break Brooke into the mainstream. Will this be the song that makes it happen? I think this one has a shot on the radio charts. I think country fans are going to like it. The song isn’t the typical let loose party anthem song that we’ve heard before and especially recently. The theme is similar with a group of friends going out to shine like diamonds out on the town. But the sound and the melody on this one are a bit different. It’s a bit more laid back and kind of mid tempo. It’s not the big time dance song that you’d hear out at the clubs. This is more like the song you’d play as you’re getting ready at the house before you call the cab to head out to the first stop. It’s a good song. It’s something a little different while also sounding family. It’s catchy and you can easily sing along with the chorus. I think it has a chance to be the first hit for Brooke.